Santa Claus Land of Lights Open Nightly! Our Santa Claus Land of Lights is now open nightly! Make sure to grab your $4 off coupon at local McDonald’s! Discount coupons ($4 off per vehicle) will be offered at McDonald’s locations in Indiana, Kentucky, and Illinois, and a portion of proceeds will be donated to Ronald McDonald House Charities of the Ohio Valley (RMHC). A complete list of coupon locations may be found here. Make sure to head over to the Santa Claus Christmas Store after the light show for your free photo with Rudolph! And guess who was listed as #1?! We’re so happy to make this list. We’ll start off in the merriest town on earth, Santa Claus, Indiana. This spectacular lights show is one of the most talked about in the entire state and will make a believer out of both children and adults. You know we don’t allow jet skis on Lake Rudolph! Santa Claus is Celebrating the Holidays with Light Displays! Santa Claus, Indiana is full of holiday activities for the whole family. One is the Santa Claus Land of Lights. It’s a light adventure that stretches for 1.2 miles. 44News reporter Amanda Chodnicki took a trip to Lake Rudolph this morning to drive through our one-of-a-kind light display. The Santa Claus Land of Lights will open this weekend Friday, December 9th through the 11th. And again from Friday, December 16th through the 31st, open nightly. People can drive through this light display between 5 p.m. and 9 p.m. Central Time. It cost $15 per car, but residents can get a $4 off coupon at tri-state McDonald’s. 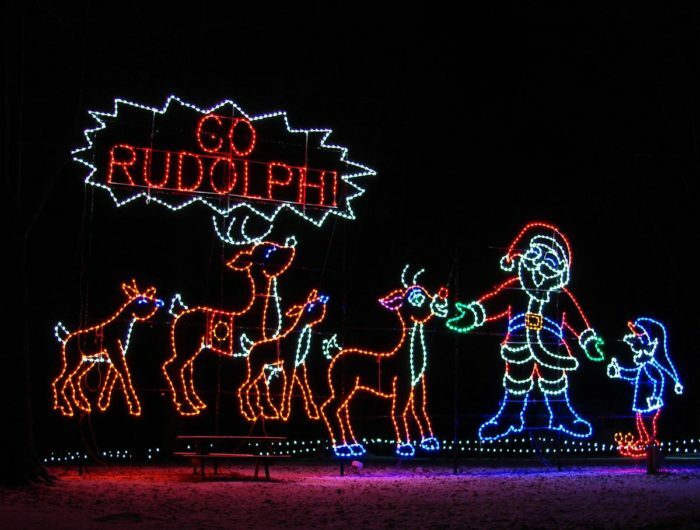 For more information about ticket prices and times, visit Santa Claus Land of Lights.